A second-generation Mormon, Sally Ashmore grew up in the mission field of Wisconsin and earned a B.A. in English from a small Catholic school in Iowa you've probably never heard of. She currently resides among other YSA's near historic Winter Quarters (Omaha), where she forces life to be interesting. Don't miss Sally's first guest post about Gladys Knight and her SUV Choir. Valentine's Day fell on a Sunday in 2010, and it was, by far, the most memorable of the twenty-seven I've been around for. The week before, on February 7th, I had been approached by a bishopric member and asked to give a talk the next week in Sacrament meeting. He had meant to ask me the week before, but I had been out of town. I accepted, knowing that I needed all the blessings I could collect to make up for the engine in my car going to that deluxe garage up in the sky. Unfortunately, he had left the paper with the topic and references in the bishop's office and would have to get it after the meeting. After the meeting, he handed me the paper, and I don't recall seeing him again when I looked up from it. The assignment was a 15-20 minute talk on Preparing for Temple Marriage. Did he forget this was a Single's Ward? Did he forget next Sunday was Valentine's Day? Did I really just agree to give a 15-20 minute talk on Preparing for Temple Marriage to a Single's Ward on Valentine's Day?! "Well, too late to back down, now," I thought as I located my sister and our ride home. I spent the entire ride kicking myself for not having taken better notes the week before, when I visited a ward in which a bachelor in his mid-30's had been assigned to speak on Celestial Marriage. I spent as much time as I could preparing during the week, since I knew my entire Saturday was devoted to playing Vanna to the magical Pat Sajak putting a rebuilt engine into my car. I even sacrificed a day's pay so I could work on my talk that Friday. 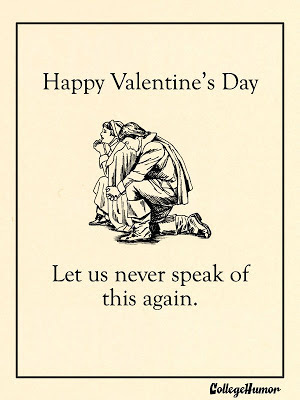 Valentine's Day finally arrived. After racking my nerves for a good amount of time (I planned an approximately one minute intro, seven minutes on preparing for the temple, a one minute transition, seven minutes on preparing for marriage, and a one minute conclusion), I sat down and let relief flood over me during the musical number. Having accomplished that task, I sat as tall as my five-foot frame allowed me to and thought, "If I can give a 15-20 minute talk on Preparing for Temple Marriage … to the Single's Ward … on Valentine's Day, I can do anything." Then the anchor speaker went to the pulpit and announced his assigned topic: Chastity. That may have been the first (although it certainly hasn't been the last) time I was grateful for my assignment. As bad as it was, it could have been that. In fact, I almost felt guilty for having felt relieved earlier. However, I don't know that our ward has ever been more unified than it was at that moment as we all gave a sympathetic cringe for our brother at the pulpit. In that one moment, every one of us felt the same truth in our heart: we did not want to be him.